When thinking about rest and relaxation, what comes to mind? Reclining on the beach while you listen to the crash of waves? The trickle of a forest creek? Camping at night near a rushing mountain river? A warm cup of coffee while rain splatters against the window? Relaxation means different things to different people, but often includes the common element of water. Whether you live in the city, the suburbs, or out in a rural area, the thoughtful use of waterscaping features is a wonderful way to turn your property into a relaxing oasis. It’s not just about the refreshing and mesmerizing look of flowing water, though. Water features add a unique quality to a landscape plan that no other element can: sound. The sounds of bubbling or flowing water add a natural tranquility to outdoor spaces and encourages relaxation. Urban homeowners tell us they love how the sounds of their water features are able to mute the noise of the surrounding city. Our clients who live in more remote areas enjoy how water features add an appealing sound to an otherwise quiet landscape, while still fitting in with the surrounding environment. Fountains and geysers add a touch of class to any property. We can accommodate a wide range of budgets and styles. We offer a number of pre-fabricated fountains from our local vendors, or our experienced stone crafters can custom design and build one as unique as your outdoor space. Waterfalls are easily one of the most versatile and customizable water features for any property. We can build your waterfall as part of a large pond-based waterscape, or as a standalone without a pond. We can also incorporate a static water supply or a recirculating system. You can even choose the noise and flow level, from a light, soothing trickle to a powerful, Niagra Falls-like crash. One of our most popular water features is the bubbling boulder. We start with a large rock that’s got some character, drill it to accommodate plumbing to send water flowing out of its top, and then install a catch basin at the base. Its easy maintenance and shutdown is a large reason for its popularity with our clients. Imagine how refreshed you’ll feel by the sight of water bubbling out of a large boulder, cascading down a rock-strewn slope, and flowing into a pond that’s beautifully colored by the fish who live there. Get all the tranquility of a Japanese garden with our custom koi and reflecting ponds. Combining both water and fire elements is a sure way to astound your guests. 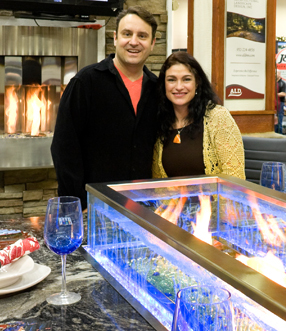 We’re proud to offer our patented “Elements” Fire & Water table to our clients. A gel-based fire sits in the center of a Plexiglas surrounding that’s been filled with bubbling water, and it all sits atop a solid stone tabletop. The visual impact of a fire that appears to be burning inside the water will delight your outdoor dining guests. You can learn more about our ALD original piece here. If you’re looking for a conversational art piece, adding a water feature might be just the thing you need to bring your work of art to life. We have the skills and tools necessary to custom-design, craft and install most anything you can come up with. Not all waterscapes have to be automated. We can build and install streams in your garden, or dry creek beds that will simulate streams during rainy weather with the added benefit of improving drainage on your property. We love mixing natural stone with water features for an authentic woods-like feel. In addition to smaller water features such as a bubbling boulder or prefabricated fountain, we also design and install larger, more complex waterscaping projects. With careful placement of boulders with water features, we’re able to achieve a highly creative, natural-looking design that will fit right in with the rest of your landscape. You can take a look at some of our previous projects in the photo gallery. We service every water feature we install, and we’ll educate you on how to run and maintain them yourself. ALD makes available a number of options that can help cut down on maintenance for your water features. Examples include ultraviolet lighting for ponds, chemical applications for larger water features, or auto float valves that maintain your water supply without the need to periodically refill. We’ve recently integrated a new technique for recirculating water features: a filter that doesn’t require a waterline. This recirculating system is virtually maintenance free, making it perfect for some of our features like simple pondless waterfalls. Water features aren’t just for residential property. Custom waterscaping is a great way to add a wow-factor to your commercial properties as well, and we at ALD can help. Adding a fountain or a bubbling boulder to a courtyard can provide a refreshing place for employees to take a break, impress potential clients and visitors with stunning visual appeal, and add actual value to your property. A favorite request we often receive from commercial clients is company signage combined with a water feature. Stacked stone or brick sign with water cascading over the edge definitely make a statement. Whatever impact you’re hoping to make, ALD is happy to work with you to create something special for your business. Your property is unique and deserves something just as special. Adding a water feature is one of our favorite ways to take a good landscape design into the realm of fantastic. We’d love to talk with you about how we can do that for your residential or commercial property. Make an appointment today for a free, no-obligation consultation by calling us at 952-242-9368 or filling out our contact form.